Poverty is a major constraint in the education of children belonging to SC/ST. Children from these communities face specific disadvantages in their education and this must be given serious attention and quality education is paramount to every child. The lack of access to resources and opportunities for the children from SC/ST is posing a threat to their education. 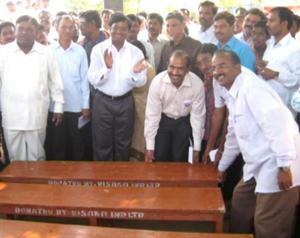 Considering the situation Visaka reached the unreached in Chennur, in Adilabad Dist. Pedapalli, Huzurabad, Ramagundam in Karimnagar Dist. These hamlets primarily have the SC/ST communities’ settlements. In the past years, Visaka have initiated an intervention that benefits the school going children, besides extending support to the Government school teachers. The main focus was to create necessary Infrastructure which would open up a new opportunity for the children to get quality education. Built 60 classrooms for schools/colleges in SC/ST hamlets in Chennur, in Adilabad Dist. Pedapalli, Huzurabad, Ramagundam in Karimnagar Dist.